Liposcelidae includes 9 genera and about 200 species distributed worldwide. About 40 species in the genera Belaphotroctes, Embidopsocus, and Liposcelis are found in North America. 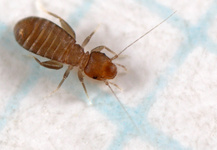 Liposcelids are very small book lice with body colors ranging from dark brown to creamy white. They live under bark, in dead leaves, dead grass, and in the nests of mammals and birds. 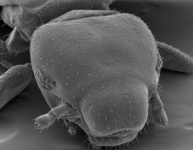 Liposcelis bostrychophila is a serious domestic pest in buildings and stored food and can develop enormous populations, due in part to their ability to reproduce asexually. Body is flattened with a long abdomen. In the male, the phallosome has broad, elongate parameres. Antennae usually have 15 segments (sometimes 17) and are relatively short. Antennal segments have ringed sculpturing (annulations). Eyes are reduced: wingless forms have 2-8 ommatidia (eye segments), more in winged forms. Hind femur is wide and flat. Coxae widely separated from one another. Adults have either full-length wings or are wingless. Wings are long, rounded, and held flat over back at rest. Wing veins are reduced: forewing has 4 veins or fewer. Phallosome has broad, elongate, curved parameres and a complex posterior region (aedeagus). Subgenital plate often has T-shaped sclerite. Eggs: Eggs are smooth, laid singly, and are covered with debris. Morphological study of the male genitalia of Troctomorpha supports monophyly of family Liposcelidae based on the broad, elongate parameres of the phallosome (Yoshizawa & Johnson 2006). Molecular data including five species of genus Liposcelis strongly supports the monophyly of the genus (18S nDNA; Johnson et al. 2004) but other genera of Liposcelidae have not yet been included in molecular analyses.